Students from Kerry Skarbakka’s Combined Media course in the art department worked with graduate students and faculty in the Dynamic Robotics Lab to create the concept for a new art installation in the newly renovated Graf Hall. The story-high wall sculpture, “A Step Above,” depicts the OSU Dynamic Robotics Lab’s robot, “ATRIAS “ walking tall on top of a pile of famous fantasy television and movie robots, including R2D2 from Star Wars, Rosie from The Jetsons, Bender from Futurama, a Dalek robot from Dr. Who and more. 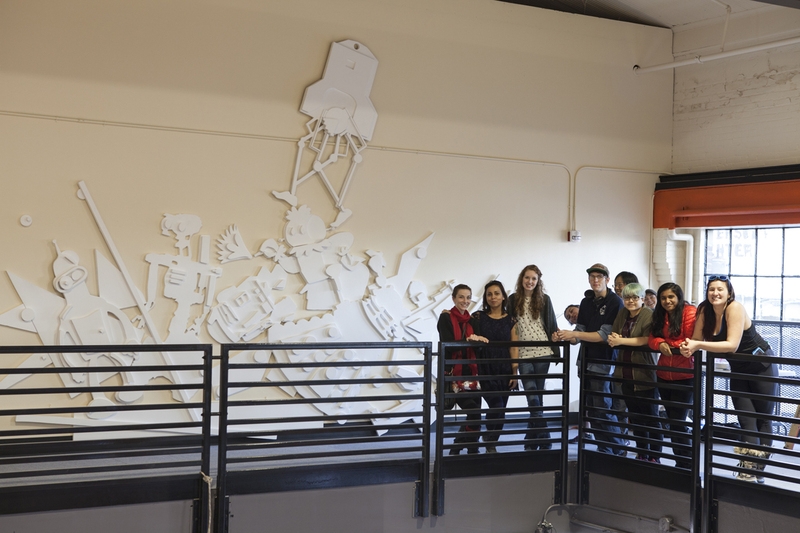 The sculpture is located on a main wall above the lab where OSU Dynamic Robotics Lab students work on ATRIUS. ATRIAS is actually not just one robot, but a series of prototype human-scale bipedal robots designed and built by the Oregon State University Dynamic Robotics Laboratory, under the direction of Dr. Jonathan Hurst. They are designed to test and demonstrate theoretical concepts for efficient and agile locomotion, ultimately aiming for walking and running outside in rough terrain. Skarbakka said the sculpture depicts all that has gone in to creating a real robot and all of the ingenuity that has gone into making this fantasy and this science fiction into a reality. “ATRIAS is walking on the backs of history, he’s walking on the backs of the fantasy giants that came before him. He’s walking on a pile or detritus of old ideas and is actually dancing on the pile itself.” Skarbakka explained. The collaborative project came about after Skarbakka, multi-media artist and assistant professor of photography, met Cindy Grimm and Bill Smart, associate professors in mechanical engineering in a weekly jiu-jitsu class. After a recent renovation of Graf Hall, Smart and Grimm thought an art installation on one of the major open wall surfaces would be a great finishing touch. Skarbakka said he was looking for an opportunity on campus to give his students professional installation experience. His students worked back and forth with Smart, Grimm, and graduate students in the robotics lab to come up with a concept everyone would be happy with. “I was looking for a collaborative project on campus for this class, and when the idea for this installation came up, I thought it could be a project that would commemorate the robotics department and leave something permanent behind from the art department,” Skarbakka said. The sculpture was carved and molded from pink foam insulation material, commonly available at home improvement centers. It was primed, sanded and painted many times before each piece was carefully screwed and calked onto the wall. It took approximately one month to create, Skarbakka said, from concept to installation. The art students who worked on the project are: Lilly Hudnell-Almas, Ludmilla Oliveira, Heather March, Nicolette Pi’ilani Tao, Tanner Henderson, Ching-Chia Ko, Teresa Yoshiura, Reid Dehle, Manasa Adajian and Catherine Fitzsimmons. The sculpture is a permanent addition to Graf Hall, and lighting and a placard will soon be installed. However, Skarbakka said the sculpture may be a work in progress as it is updated to represent other innovations in OSU robotics. “We planned for the addition of other current and future OSU robots. There is room for that,” Skarbakka said.